This is my Easter tree. Every year, we cut a few suckers from the poplar trees at the end of our street and pop them in water. It only takes a few days before the warmth of the house encourages them to unfurl their delicate leaves. This year, I decorated the branches with knots of Baja Breeze, Pretty-inPink and Daffodil Delight ribbon and flowers cut out with the Boho Blossoms punch and embellished with self-adhesive pearls. The flowers were suspended from the twigs with green cotton. This display is all about the beautiful Hope and Strength stamp set. For every one of these sets sold Stampin' Up is donating £1 to the Breast Cancer Research Foundation. Do buy it for that very good reason - but also because it's a gorgeous set. This is my favourite piece of furniture in my house. It's a Scotch dresser which was rescued from being used as a work bench in some guy's garage! 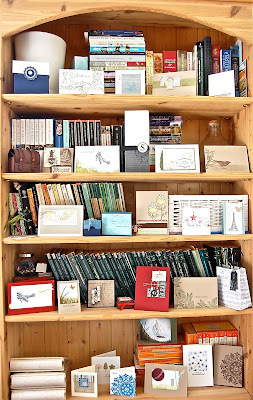 I love those curved lines along the top - and it's the perfect place to display cards and bags and other little projects. The prize for my free draw was displayed here too along with leaflets telling my guests about some of my special offers. ...my guests got to choose a free gift when they booked a party with me on the day, or signed up with Stampin' Up. Have you spotted my gorgeous antique telephone? I remember the days when we used these phones at work! Doesn't time whiz by! 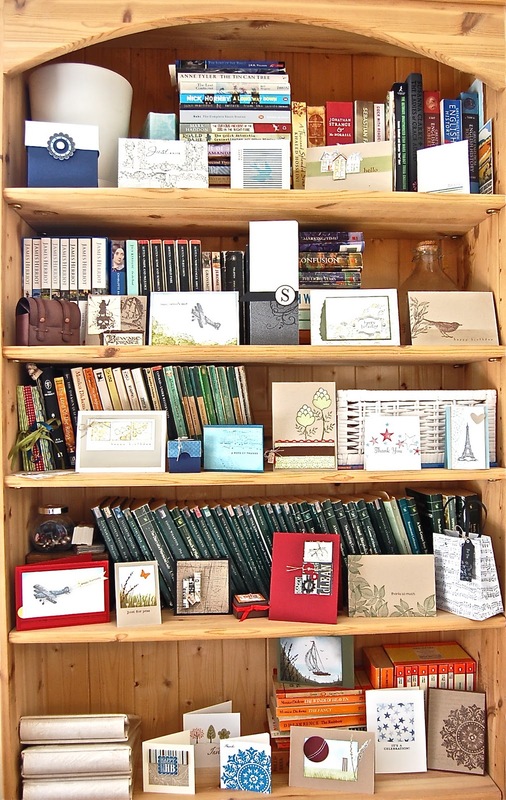 This was the bookcase where I displayed my masculine cards. Am I slightly weird to enjoy making these cards?! On the chimney breast in my living room hangs a metal tree sculpture that is another of my favourite things. I decorated it with this Easter bunting made from the utterly gorgeous new Springtime Vintage designer papers and the brilliant Timeless Type Sizzlits alphabet. The flowers were made with the fancy flower punch. Oh look at those papers - they make me melt! And I've used the alphabet almost every day in the month it's been living with me! Look! It's my beautiful Big Shot! The only thing this fabulous piece of kit doesn't seem to be able to do is make the tea - and I'm working on that! There's the Timeless Type alphabet in that great little box to the right of it. It actually includes numbers as well as upper and lower case letters and also a selection of symbols and hearts and a button - all so useful. Thank you for joining me on my little tour! Of course, I'll be showing you some of the projects in more detail over the coming weeks. In the meantime, if you'd like to see all the lovely new goodies in the mini catalogue, click the online one in my side bar or email me if you'd like me to post you a free copy. Tomorrow, I'd like to show you something I made with the gorgeous Baby Blossoms set for a very special organisation. Do come and join me then! Beautiful - wish m,y house was so tidy and organised!! and I have a very similar tree thing on my chimney breast as well - only ours has a bridge and river rather than a fence - but I love what you did with it - very fun!! My word you have been a busy girl. So many gorgeous samples, it must have taken you ages. I must confess to having a nosey at your lovely home as well as your samples lol. Vicky,you have surpassed yourself this time. I particularly liked the Easter Tree and your banner with the flowers, well everything really! Thank you for showing us your lovely home no need to 'guess whose house this is'!! Wow Vicky! You've made some stunnig projects. Love how you decorated the metal tree sculpture in your living room and the poplar tree sprigs. Oh and yes I do think you are a little weird for enjoying making men's projects, it's my least favourite thing by far!! Wish I lived a litle closer so I could have attended your open house! Wow luuurvely projects and a gorgeous house to display them in. Looks like you had a fab day. WOW! What a lot of inspiration! I hope that lots of stampers came by to enjoy! I like to do masculine cards too. Vicky your samples all look stunning ! The tree sculpture is amazing, perhaps you should change it for each of the seasons lol ! Fabulous display of your creations, and I love your vintage furniture. Your bunting is lovely draped across your wall art. You displayed everything so beautifully Vicky. I wish I could have dropped in but I am a bit far away. So, so, so fun to walk around your house with you and see all your beautiful displays... even if it was done virtually! I especially love the flower garland hanging on your metal sculpture trees along with the Easter bunting. I hope your day was wildly successful!